How cute are those ten pound notes? What do you mean, you don’t know what I’m talking about? Go and watch the video above NOW! I’m all about paying it forward and love hearing about random acts of kindness, so I loved this video. It may have brought a smile to my face but Beagle Street do have a serious point to make: life insurance is really important, but it doesn’t have to cost you a fortune. I know, life insurance is boring – but hear me out, if only to humour me. My husband took out life insurance this week and he’s paying somewhere around £15 a month. I thought that was a good price actually, because I always thought it would be more expensive which is probably one of the reasons I’ve been putting it off for so long. I don’t have any yet, but it is something that’s been on my mind for a while. Since we have two children we really ought to make sure they are looked after if the worst happens. Beagle Street say that their insurance is affordable, and that their insurance is ‘30% cheaper on average’ … we’ll see about that, I thought, and off I went to their website. I couldn’t get an instant online quote from Beagle Street’s site because they take your details and call or email you once they’ve found the best deal they can offer. 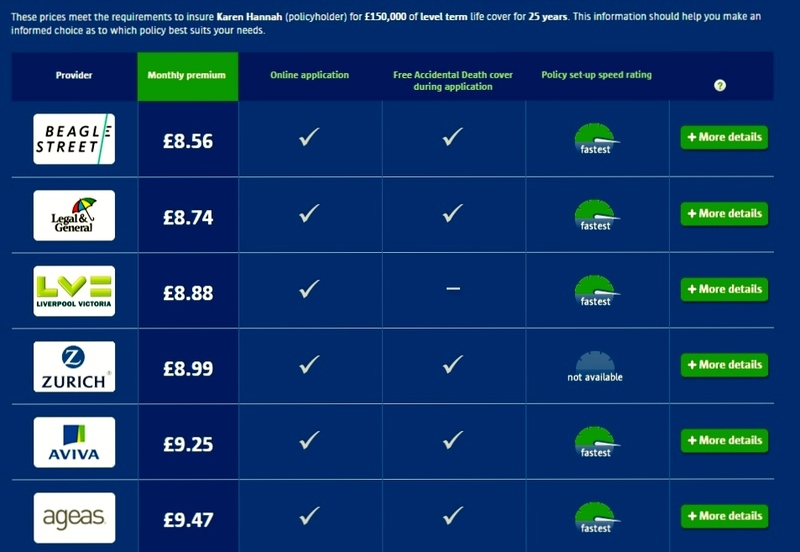 In the meantime I thought I’d better use a comparison website to get some other prices, so I can see the difference between the two. I was certainly surprised when I saw the results of the comparison site! So I really don’t have to wait for them to get back to me if I don’t want to – they came top in an independent comparison anyway. That’s for 25 years cover though which only takes me to age 58 so I’d have to tweak the search settings a little bit when I do come to buy insurance. Do you have life insurance? What age were you when you took it out? Did you wait until you had kids, or maybe a mortgage or was it something you did as soon as you started your working life?